Life’s at its best when the only thing between you and the world is just the wind and the open road. That’s the thinking behind Intrepid’s brand new cycling trips. There’s a nice simplicity to cycling. You start at A and slowly ride your way to B, powered by nothing but your own legs…and maybe a Provençal orange cake and a couple of glasses of vino. This is cycling Intrepid-style. Which means it’s not the Tour de France. You don’t get prizes for coming in first, and the lycra bodysuits are definitely optional. These trips are for people who really want to see a place. Not just travel it. Ride on. This dedicated range of cycling tours all over the world is designed for riders of all levels, and run by top-notch cycling guides. Intrepid’s new pedal-powered tours run through the lavender fields of Provence, Morocco’s epic mountain passes, and sun-dappled orchards in Croatia and Andalucia. Some are classic cycling destinations, others are a little off-road, so to speak. Although your transport is mostly of the two-wheeled variety, these trips are still classic Intrepid. And that means plenty of real life experiences. It may be pulling over for an impromptu game of soccer in Panama, or drinking chai with friendly locals under a roadside tree in Rajasthan. Maybe even spottinhg an elusive cheetah in Sri Lanka’s Yala National Park. They’re the moments that you can’t really plan for. The little details you won’t find in any travel brochure. On most of Intrepid's cycling trips, you'll be using hardtail mountain bikes, armed with front suspension. Depending on the country, there's a mix of makes and models, like Giant Talon and Trek X Caliber 5, but they’re all pretty similar when it comes to form and function. Bikes are serviced regularly in-country, by local experts who know their stuff. A support vehicle travels around with the group, so any pesky broken chains or flat tyres can be fixed in a jiffy. Riding in groups of about 10 people (on average) means you can reach places other cycling tours can’t: think a hole-in-the-wall restaurant in Cuba’s Las Terrazas, a stilt-house homestay in Mai Chau, Vietnam, or maybe an afternoon picnic on the ancient Tuscan ramparts of Lucca (try getting that from your big bus tours). A smaller group also means you get more one-on-one attention and support. If you’re tiring after a long day in the saddle, or you’d like a bit more time at a little Provencal market, just mention it to your leader. They’ll do all they can to help. Our local leaders are all cycling junkies, as you’d expect, but they go through some pretty rigorous training before being allowed behind the handlebars on an Intrepid tour. Each one has undergone on-road supervision and knows how to do safety checks, basic repairs and emergency first-aid. And at the end of the day they’re still regular Intrepid leaders, which means they know the best local bars, cafes and hidden spots (not to mention handling all the boring logistical stuff ). You just focus on the ride. Picking the right cycling trip is the difference between breeze-in-your-face, carefree adventure and feeling like your legs might drop off. All of our trips are designed for a basic level of cycling fitness, but some do climb a little higher, cycle a bit further, have less rest days, or have more challenging weather than others. 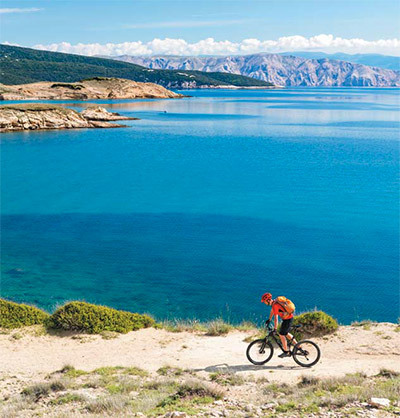 People who ordered Cycling Adventures Worldwide also ordered the free travel brochures below. Click on the images to find out more about these brochures.